Satellite monitoring of landscape freeze-thaw state and associated constraints to the North American carbon budget. Approximately 68-80 percent of the North American region experiences seasonal freezing and thawing with the relative influence of these processes on terrestrial carbon budgets generally increasing at higher latitudes and elevations. The timing and duration of surface and soil freeze-thaw state is closely linked to vegetation phenology and growing season dynamics in northern temperate, sub-alpine, boreal and arctic biomes. Variability in these environmental variables also has been shown to have dramatic impacts on spatial patterns, seasonal to interannual variability and long-term trends in terrestrial carbon budgets and surface-atmosphere trace gas exchange primarily through biophysical controls on both photosynthesis and respiration. These processes are strongly influenced by land cover and soil properties, as well as the timing and condition of regional snow cover. We are applying daily time series radar backscatter information from the SeaWinds Ku-band scatterometer to quantify spatial patterns and daily, seasonal and interannual variability in landscape freeze-thaw status in support of the North American Carbon Program (NACP). We are investigating synergistic relationships and trade-offs in relative sensitivity, spatial scale and temporal monitoring capabilities between SeaWinds freeze-thaw and MODIS land surface temperature (LST) products for quantifying landscape freeze-thaw state and thermal and moisture controls to vegetation gross primary production (GPP) and net primary production (NPP). We are quantifying the spatial and temporal patterns of these variables and determining their relative importance in determining seasonal patterns and annual variability in vegetation productivity using a modified form of the MODIS Production Efficiency Model (MOD17). We are also investigating relations between the microwave based freeze-thaw signal and surface biophysical network measures of the surface energy budget and associated linkages to soil respiration and land-atmosphere CO2 exchange dynamics. These results are being integrated within the larger NACP project to provide a comprehensive assessment of the North American carbon budget. Map of the relative impact of low temperature on vegetation productivity for the North American study domain derived from the MODIS MOD17 time series. Darker blue regions denote areas where cold temperatures are a significant limitation to GPP, as determined from the MODIS LAI and FPAR time series (2000-2004) and MOD17 algorithm. Areas in white include non-vegetated surfaces and areas where low temperature is not a significant constraint to plant growth. Vegetation productivity over approximately 33% of Earth’s global vegetated surface is limited by cold temperatures and water in its frozen state. This investigation is characterizing the relative control of freeze-thaw state on the annual carbon budget of the North American domain. Jones, M.O., S.W. Running, J.S. Kimball, N.P. Robinson, and B.W. Allred, 2018. Terrestrial primary productivity indicators for inclusion in the National Climate Indicators System. Climatic Change https://doi.org/10.1007/s10584-018-2155-9. Kim, Y., J.S. Kimball, K. Didan, and G.M. Henebry, 2014. Response of vegetation growth and productivity to spring climate indicators in the conterminous United States derived from satellite remote sensing data fusion. Agricultural and Forest Meteorology, 194, 132-143. Rawlins, M.A., R.S. Bradley, H.F. Diaz, J.S. Kimball, and D.A. Robinson, 2016. 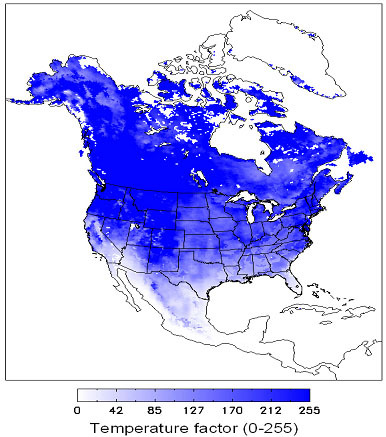 Future decreases in freezing days across North America. J. Climate, 29 (19), 6923-6935. Yi, Y., J.S. Kimball, and R.H. Reichle, 2014. Spring hydrology determines summer net carbon uptake in northern ecosystems. Environmental Research Letters, 9, 064003.